I recently learned how to tell when it was time to retire your bra. Bras are made with three sets of clasps/hooks. When new, you should be using the first clasp making it the widest or loosest setting. As time goes on, bra materials stretch. When it starts getting a little looser, you should use the middle set of hooks. 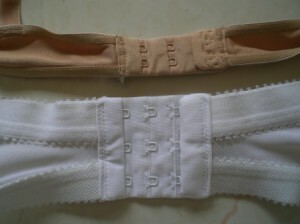 The last set of clasps and hooks will be the tightest setting for when your bra material has fully stretched out. After that, it's time to get a new bra!